In St. Peter’s Basilica, a man sits in a confessional asking forgiveness for a murder he’s about to commit. And a young priest begins a desperate journey to stop him. It’s the beginning of a ruthless race to find a rumored cache of sacred texts that could be one of the most explosive discoveries of all time. For as Clara Tannenberg and a team of renegade archaeologists journey deep into an Iraq on the brink of war, another far more sinister group is determined to get there first. 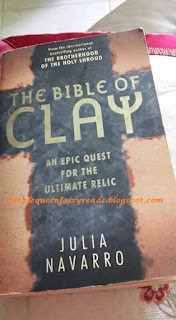 Sweeping from the time of the biblical patriarchs to the front lines of the Iraqi conflict, from the horrors of Nazi Germany to the back rooms of Washington, D.C., The Bible of Clay is a novel of unrelenting, thought-provoking, and all-too-plausible suspense. This book is not spiritual at all and has nothing much to do with the Christian faith other than that the clay tables the archaeologists are trying to find supposed to have contained words by Abraham on how God created the world. Other than that, its a struggle against time to find these tables in an archaeological site before the Iran war starts. There's lots of characters and lots of frictions and it was all quite confusing at first but as the book settles itself down and the plot develops itself, the picture became clearer. There's no one that I can really cheer and root for in this book. While Clara Tannenberg is supposed to be the main character, there are many others vying for the limelight as well and Clara is not someone likable...in fact, I was quite hoping she would fail. It took me quite a while to read this, reason being it's a thick book but also because I was busy with other commitments. I was pretty glad to have finally done with it.